The BPAF grant committee vote was unanimous with most agreeing that the quoted words fit perfectly with the Balsa Man event, and one member who voted yes purely on the quality of the paper stock (Strathmore Imperial Watercolor 140lb Cold Press). As a result, the Black Pebble Arts Foundation is proud to announce it’s first tiny art grant award of $5 to Nara Brados for her project Tiny Bed of Roses! *UPDATE TO GRANT GUIDELINES: As a direct result of this proposal, the BPAF has now revised their grant proposal guidelines and the word limit is now 100–150 words in order to reduce eyestrain and work place injuries. The Pacific Ocean here in San Francisco is not known for sweltering temperatures; however, that does not mean we do not need ice. Surely, if there was no ice, one’s drink may get lonely with only the glass for company. 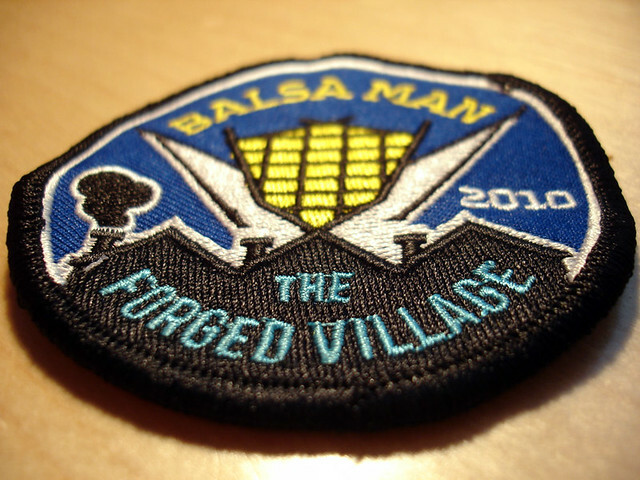 At Balsa Man, ice is especially useful just in case a participant gets over excitable; you then may find yourself in dire need of ice to cool them down. For these reasons and more, Balsa Man has approved it’s first vendor: Polar, the one and only location where you can buy precious ice at Balsa Man! All proceeds of ice will be donated to local charitiable organizations. Polar will be no boring vendor, Veronica Fetzner and Simon Sutherland’s artistic vision using foam core for Polar is excellent and their detailed postcard encapsulates why the Black Pebble Arts Foundation has chosen to award them a tiny art grant of $15 so they can buy baggies. This is a large grant by the BPAF standards, but we feel it’s justified due to the importance of having ice available at Balsa Man. Support for the Black Pebble Arts Foundation is taking off at a breakneck pace. Many thanks to everybody who has donated! We had a fabulous donation of $20 from @edrabbit (member of Interpretive Arson and creator of a miniature Dance Dance Immolation for last year’s inaugural Balsa Man). This year, he hopes that his donation might fund an artist to create a miniature version of 2πr. We have also heard from a few artists already who are interested in creating tiny art, but we have yet to receive any formal grant requests. Participation is what makes Balsa Man grand so send us your art proposals! Oh, come on. You know you wanna build something. Become inspired and then head on over to Tiny Art & Grants to read our Tiny Art Guidelines on how to apply for a Tiny Art Grant. or not. While we do enjoy fire, we understand that not all art must be set aflame to be meaningful. Posted in Balsa Man, BPAF | Comments Off on Participate! Create! Immolate! Jeff Ross, founder and director of the SF Indie Fest, has promised a $10 matching donation to the Black Pebble Arts Foundation for the next donor who donates $10 or more! Remember donations are used to fund tiny art grants for our wonderful tiny artists. Well that was fast! We have already received our $10 donation. Congratulations donor your donation has been doubled! The SF Indie Fest is long-time supporter of small budget artists, musicians, and filmmakers. Don’t miss the 8th annual DocFest, October 16 – 28, 2009. Also, submissions for the 2010 SF Independant Film Festival are now being accepted through October 10th, 2009.